In a large pot, boil the chicken broth. Simmer, add saffron, stir until the saffron has cooked about 5 minutes. Bring back the broth to a boil. Add the orzo and cook until tender but still "al dente" (firm to the bite). Stirring occasionally, about 8 minutes. Depends on the kind of the orzo, some orzo don't absorb all the liquid, so you have to drain it. I didn't have to do it with mine (Da Vinci). Transfer to a large bowl. Combine 4 tbsp of evoo, the parsley, half the lemon juice, 1 tsp salt, and 1 tsp pepper. and cook until they are just turning pink, about 2 minutes per side. 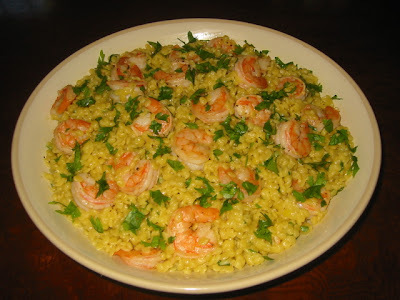 Add the shrimp to the bowl with the orzo. Toss them and serve. Tips: when you have to serve it at room temperature, make sure you stir the orzo occasionally to avoid clumping.